An attack made through a burst of electromagnetic energy could render crucial electronic systems ineffective, jeopardizing national security and important infrastructure such as data centers and power grids. Christopher Tuan and Lim Nguyen, two engineers from Nebraska, have developed an inexpensive concrete that is capable of shielding against strong pulses of electromagnetic energy, or EMP. Electronics inside structures coated or built with this shielding concrete are not prone to EMP. The concrete is ready to be commercialized; American Business Continuity Group LLC, a company that develops disaster-resistant structures, has signed an agreement to procure the license to this shielding concrete. Electromagnetic energy is present everywhere. The energy travels in the form of waves, and spans a broad spectrum from sunlight, radio waves and microwaves to gamma waves and X-rays. However, an EMP or a high-altitude nuclear explosion can cause a burst of electromagnetic waves, inducing voltage or electric current surges that can result in widespread electronic failure. EMP is very lethal to electronic equipment. We found a key ingredient that dissipates wave energy. This technology offers a lot of advantages so the construction industry is very interested. 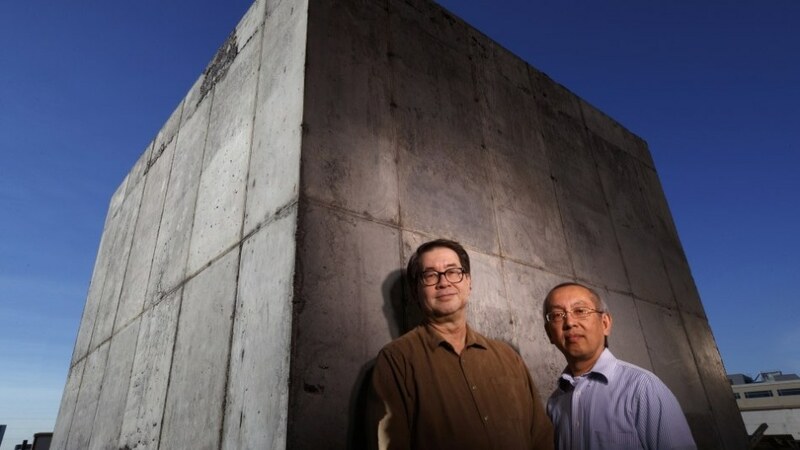 Tuan and Nguyen’s collaboration to explore concrete that has the capacity to conduct electricity gave birth to EMP-shielding concrete. The engineers initially developed the patented conductive concrete with the intent of melting ice and snow from surfaces, such as bridges and roadways. They also found and confirmed that the concrete has one other significant property; it could block electromagnetic energy. The technology operates by absorbing as well as reflecting electromagnetic waves. The engineers used their main ingredient magnetite, a mineral that has magnetic properties and can absorb microwaves like a sponge, to replace some regular concrete aggregates. The recipe of shielding concrete includes metal components and carbon for better absorption and reflection. Thanks to this ability to both absorb as well as reflect electromagnetic waves, the shielding concrete is much more effective than other shielding technologies of the day. The technology is also more flexible and cost-effective than other existing shielding methods, said Tuan. The current shielding technologies make use of metal enclosures that need costly metal panel or screen construction that limit their feasibility in huge structures. The Nebraska team entered into a research agreement with ABC Group, and modified their shielding concrete to work with the shotcrete construction technique of the company. The end product is yet to be patented, and can protect structure interiors from electromagnetic interference like microwaves, radio waves and electronic eavesdropping. The material can be used to protect financial, military and other structures that store valuable electronics, such as aircraft or data servers. Shotcrete is a spray-on technique of applying concrete, which can be employed to cost-effectively retrofit existing buildings, an important benefit for protecting important military installation and infrastructure, said Tuan. A prototype structure was built by the ABC Group recently at its disaster recovery complex in Lakeland, Florida, to demonstrate the effectiveness of the technology. The structure exceeded military shielding needs. “The concrete has the ability to provide what we call a multi-threat structure," said Nguyen, professor of electrical and computer engineering, who traveled to Florida to assess the prototype structure. "The structure has to be able to withstand an attack either by an explosive or an electromagnetic attack or other scheme." Mauricio Suarez, director of licensing at the university's non-profit technology commercialization affiliate, NUtech Ventures, stated that as per the licensing agreement the exclusive rights to sell the shielding shotcrete product is with ABC Group, whose EMSS-Electromagnetic Shielding Shotcrete is commercially available now. Our proprietary construction methods, which incorporate the Nebraska-developed technology, enable us to construct high-strength, blast-resistant structures that exceed military electromagnetic shielding requirements. Our prototype building has been well received as a new shielding construction material by leading experts in the EMP community. Engineers Tuan and Nguyen are investigating further uses for the conductive concrete, including anti-static flooring applications, and enhancing de-icing and radiant heating. NUtech Ventures is assisting the engineers in applying for patents and navigating further potential licensing agreements, as new formulations increase.